90-lb Heavy Duty Portable Rubber Sign Stand with 5-foot 1.5-inch White PVC Post and one pair of sign mounting brackets. 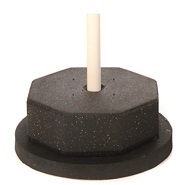 Base consists of a 30-lb round 22-inch diameter rubber base joined with three 6-inch lag screws to a 60-lb octagon rubber base. Height: 9 inches. (Wheels not an option with this base).